There are several finishing sprays that claim to ‘hold’ your makeup for hours on end. I have tried several from Urban Decay and MAC, and while I found them to be OK, they weren’t making a difference on my clients. When I complete a look, I want it to last all night….literally. Living in South Florida, every girl questions what makeup they will use due to the extreme humidity we deal with on a daily basis. There have been several times where I notice a love bug with makeup running and slowly peeling off by the end of the day or in the park or beach, and all I want to do is walk over and help a sister out. 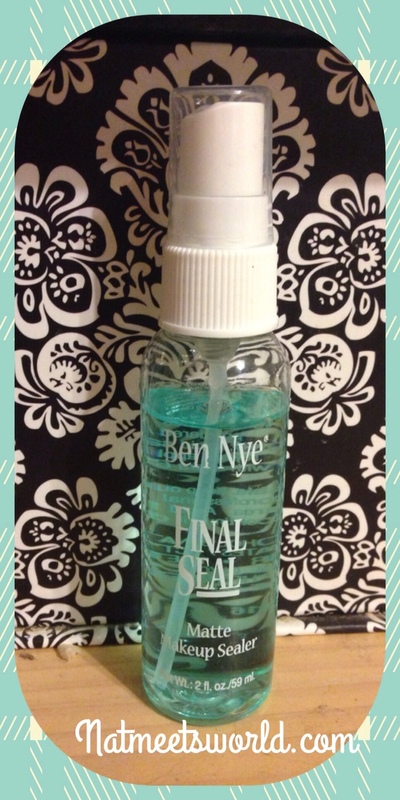 Since I was unhappy with the setting sprays I had tried on my clients, I did extensive research on setting sprays, and came across Ben Nye’s Final Seal Matte Makeup Sealer. This minty smelling product is now officially part of my holy grail collection. I have never used a product that lasts as long as this setting spray does. I can put on a full face of makeup at 7 AM and with the setting spray, I will STILL have a full face of makeup by 9 PM! Final Seal offers a smudge free, waterproof matte ‘top coat’ that works with most makeup brands. To use, make sure you have completed your makeup in its entirety. Hold the spray 8 to 10 inches away from your face and spray. Avoid saturation! This should be done lightly. Once it dries, repeat if desired. Usually when I do a bride’s beautiful face I will do two coats of the spray. The setting spray works with dry water-based, powdered, and creme makeup. Ever wonder how the Disney characters (such as the princesses) have long lasting makeup after being in the sun all day? They use Ben Nye’s Final Seal! I ordered my Final Seal spray from Amazon.com because I found it cheaper there. I purchased two 2 ounce bottles for about $16.00. That may seem like a lot to some, but it is well worth it when you have to deal with humidity or extreme weather conditions. It is also cheaper that purchasing a setting spray from Sephora or MAC. Have you tried Ben Nye’s Final Seal? What do you think about it? Comment below! If you haven’t tried it, give it a shot….it may be one of your holy grails too! 16.00 is actually a really great price! I may have top pick up some of this and give it a try!